The Malaysian government has released the Safety Investigation Report into missing Malaysia Airlines flight MH370, which says investigators have been unable to determine the real cause for the disappearance of the aircraft. The report was made public in Kuala Lumpur on Monday, first to the relatives of those on board and later to the media. It was also published on the Malaysian Ministry of Transport website. The Malaysia Airlines Boeing 777-200ER 9M-MRO disappeared en route from Kuala Lumpur to Beijing on March 8 2014 carrying 239 passengers and crew in what is one of aviation’s greatest mysteries. A search of 120,000 square kilometres in the Indian Ocean conducted by the Australian, Chinese and Malaysian governments ended in January 2017 without the aircraft being found. Meanwhile, investigators from Malaysia and seven other countries analysed flight data, air traffic control procedures, maintenance records, the cargo on board and the background of the two pilots in the flight deck, among other lines of inquiry. 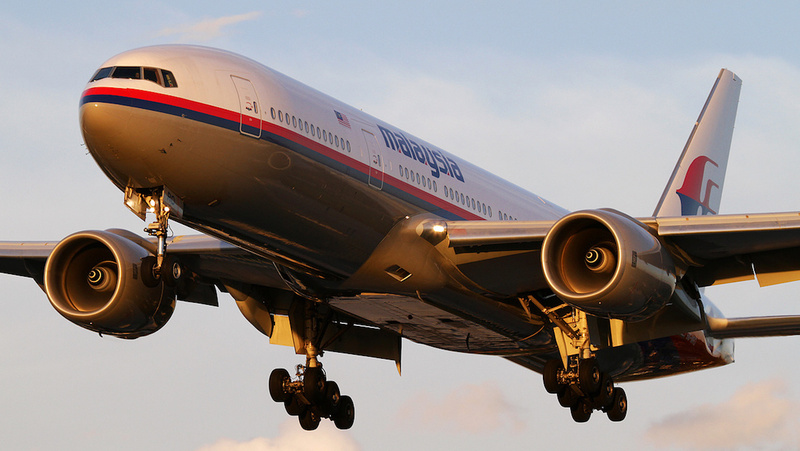 But with the 777-200ER 9M-MRO still missing more than four years after MH370 took off for Beijing, the report said it was difficult to conclude with any certainty what took place on that fateful night in March 2014. What the report did say was that the evidence showed flight MH370 diverted from the filed flightplan route, with the aircraft flying back across Peninsular Malaysia and headed towards the Southern Indian Ocean. The changes to the flightplan were “difficult to attribute to anomalous system issues alone”. “It could not be established whether the aircraft was flown by anyone other than the pilots,” the report said. Australia’s Deputy Prime Minister and Minister for Infrastructure and Transport Michael McCormack said: “I am aware this report does not provide the answers the family and friends of the 239 people on board were seeking”. “I have recently spoken with each of the families of the Australians on board and I acknowledge the sense of loss with which the family, friends and loved ones of the passengers on board MH370 live today and every day,” McCormack said in a statement. The report said there was no evidence to suggest the Pilot In Command (PIC) and First Officer (FO) experienced any changes or difficulties in personal relationships or that there were any conflicts or problems between them. “The PIC and FO held valid airman licences and medical certification,” the report said. “All the flight and cabin crew were certified fit to fly and were within duty-time limits at the time of the flight and were adequately rested. “There had been no financial stress or impending insolvency, recent or additional insurance coverage purchased or recent behavioural changes for the crew. There has been much speculation about the cargo carried on board the aircraft, with investigators noting two items of interest being the 221kg of lithium ion batteries and the 4,566kg of mangosteen fruit. 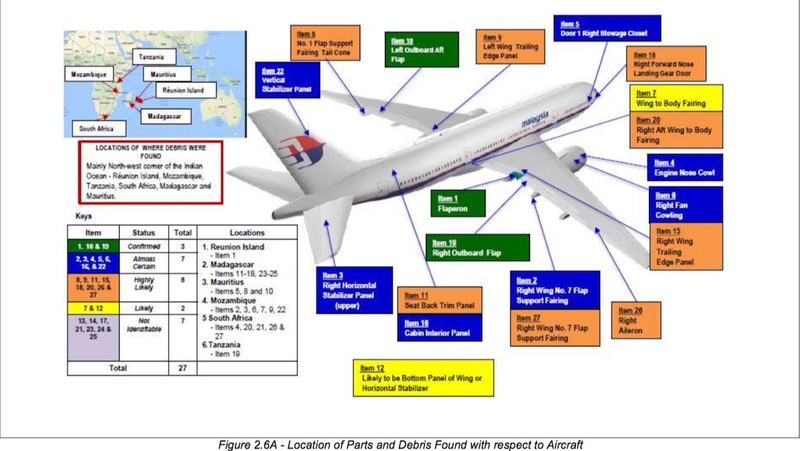 The report noted these items were packed and loaded according to standard operating procedures and had been transported on Malaysia Airlines flights both before and after the disappearance of MH370. “Extensive tests conducted on the mangosteens packed with water-soaked foam and juice extracts of mangosteens in contact with Lithium ion batteries revealed that this could only be hazardous if exposed to a certain extreme condition and over a long period of time,” the report said. 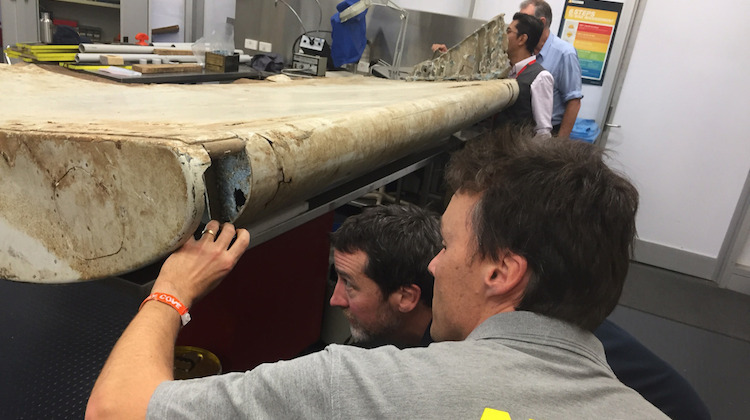 The search for MH370 first conducted by the Australian Transport Safety Bureau (ATSB) and then later by private company Ocean Infinity on a “no cure, no fee” basis , failed to locate the aircraft. However, there have been a number of fragments that were determined to have come from the 777-200ER 9M-MRO, with debris such as wing parts and cabin interiors found as far north as the eastern coast of Tanzania and far south as the eastern coast of South Africa, as well as several other islands and island nations off the east coast of the African continent. This included a right wing flaperon that an analysis from the ATSB in November 2016 indicated was “most likely in the retracted position at the time it separated from the wing”. Further, the ATSB said the right flaperon was “probably at, or close to, the neutral position at the time it separated from the wing”. Further the ATSB analysis, alongside additional analysis of the satellite communications data was “consistent with the aircraft being in a high and increasing rate of descent at that time”, the ATSB said. The report said the analysis of the cabin interiors found indicated the aircraft was likely to have broken up. However, there was insufficient information to determine if the aircraft broke up in the air or during impact with the ocean. “No other information about in-flight emergencies, aircraft configuration or impact could be inferred from the nature and damage of the debris,” the report said. More broadly, the report said that without the benefit of examining the aircraft wreckage or flight data information, the investigation was “unable to identify any plausible aircraft or systems failure mode that would lead to the observed systems deactivation, diversion from the filed flight plan route and the subsequent flight path taken by the aircraft”. “However, the same lack of evidence precluded the investigation from definitely eliminating that possibility. The possibility of intervention by a third party cannot be excluded either,” the report said. The investigation team comprised 19 Malaysians and seven accredited representatives from the Air Accidents Investigation Branch (AAIB) of United Kingdom, Australian Transport Safety Bureau (ATSB), Bureau d’Enquêtes et d’Analyses pour la Sécurité de l’Aviation civile (BEA) of France, Civil Aviation Administration of the People’s Republic of China (CAAC), National Transportation Safety Board (NTSB) of the United States, National Transportation Safety Committee (NTSC) of Indonesia, and the Transport Safety Investigation Bureau (TSIB) of Singapore. Surely we never expected anything of value to come out of a Malaysian Report. The Captain allegedly was a prominent supporter of the new Malaysian Government leadership. Where does anyone address the roll of the US who were aware an hour after the aircraft was uncontactable yet with the so called superior Star Wars global system they couldn’t use the pine Gap based operations to track an aircraft with no transponder which could have been a rogue military aircraft. Why could the US only provide one destroyer for the search when they have Diego Garcia and the fleet in the Indian Ocean. Where are the real investigative journalists? 1. About 40 mins into the flight, air traffic control gave the pilot the radio frequency for Ho Chi Minh City. The pilot did not respond with confirmation of the new radio frequency. Which is standard procedure. 2. The aircraft turned 180 degrees towards Penang which could not be done by an auto pilot and can only be actioned by an experienced pilot. 3. This manoeuvre would have created an audio “bank angle” warning and additionally the stick shaker would have been activated. 4. The pilot could have easily locked the co pilot out of the cabin. 5. All aircrew and passengers would have died of hypoxia and died during the 180 degrees manoeuvre. 6. There is no reason that the military aircraft were not scrambled. More work needed on the report I suggest.